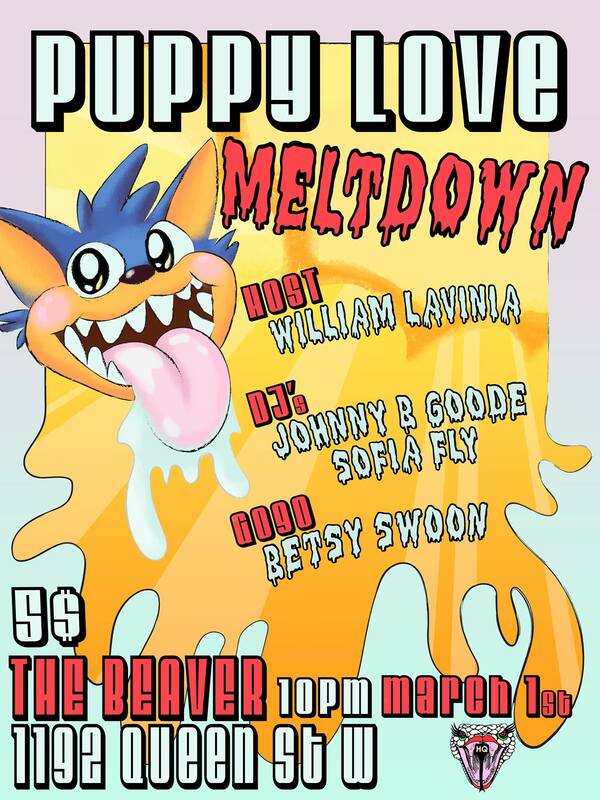 PUPPY LOVE: A Heckin’ Queer Dance Party! Let’s dance so hard we melt every snow sludge pile on Queer St W! SPRING IS COMING, LET’S MANIFEST IT! 10-12:30: LAST MIN CAST SWITCH: cuntybeatz (IG: @kuntybeatz) will be filling in Johnny B Goode’s absence. We’re lookin’ forward to their puppy love debut! 11PM-1:30AM Betsy Swoon (IG: @betsyswoon): Our favorite burlesque beauty is back up on the bar! She’ll be melting hearts and taking cash faster than you can say Spring Equinox! 10PM DOOR | $5 | NO ONE WILL BE TURNED AWAY BECAUSE OF LACK $$$, if you don’t have $5 to spare, please come dance anyway, you will be let in! As we gather in this radical queer space in Tkaronto we would like to acknowledge that we are meeting on aboriginal land that has been inhabited by Indigenous peoples from the beginning. As settlers, we’re grateful for the opportunity to meet here and we thank all the generations of people who have taken care of this land – for thousands of years. Long before today, as we gather here, there have been aboriginal peoples who have been the stewards of this place In particular, we wish to acknowledge the Ancestral Traditional Territories of the Ojibway, the Anishnabe and, in particular, the Mississauga’s of the New Credit whose territory we are gathering on today. This territory is covered by the Upper Canada Treaties. We recognize and deeply appreciate their historic connection to this place. We also recognize the contributions of Métis, Inuit, and other Indigenous peoples have made, both in shaping and strengthening this community in particular, and our province and country as a whole. As settlers, this recognition of the contributions and historic importance of Indigenous peoples must also be clearly and overtly connected to our collective commitment to make the promise and the challenge of Truth and Reconciliation real in our communities, and in particular to bring justice for murdered and missing indigenous women and girls across our country.